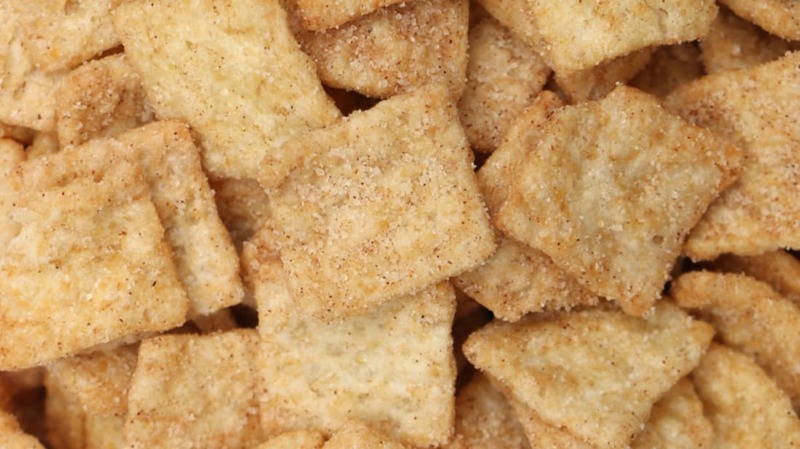 Cinnamon Toast Crunch has been serving up crunchy little squares of deliciousness since 1984. Besides cinnamon and sugar, the cereal is made with wheat and rice to mimic the taste of cinnamon toast. Read on for 10 sweet things you might not know about Cinnamon Toast Crunch. 1. EVERYONE LOVED CHEF WENDELL. Every good cereal needs a mascot, and Cinnamon Toast Crunch is no different. Chef Wendell is the rotund little baker who first appeared on the cereal’s boxes and TV commercials in 1987. Wearing glasses, a white baker’s hat, and an apron, Chef Wendell is a jolly old man who sang while he baked, and was sometimes seen with two other (younger, and more slender) bakers. 2. RUMOR HAS IT THAT WENDELL WAS RESPONSIBLE FOR THE DISAPPEARANCE OF THE OTHER TWO BAKERS. In 1991, Wendell’s two coworkers in the bakery (named Bob and Quello) disappeared from all Cinnamon Toast Crunch commercials and cereal boxes. Fans jokingly speculated that Wendell was jealous of his coworkers’ youth and buffer bodies, so he drowned them in a cinnamon swirl river. In reality, General Mills stated that consumer feedback led them to remove the other two bakers and feature Chef Wendell more prominently. 3. IN 2009, GENERAL MILLS FIRED WENDELL AND INTRODUCED THE CRAZY SQUARES. Since 2009, Cinnamon Toast Crunch boxes haven’t shown Chef Wendell’s image. Instead, General Mills has moved on to a different mascot, the Crazy Squares, who made their television debut in 2010. The Crazy Squares are anthropomorphic pieces of cereal with cinnamon swirls on them. 4. THE CEREAL HAS SPAWNED SO MANY OTHER VARIETIES. To capitalize on the popularity of Cinnamon Toast Crunch, General Mills introduced French Toast Crunch in 1995, offering little squares flavored like French toast rather than cinnamon toast. Peanut Butter Toast Crunch cereal, introduced in 2004, was a nutty variant of Cinnamon Toast Crunch, while Frosted Toast Crunch and Chocolate Toast Crunch had a sugary vanilla and chocolate coating, respectively. General Mills also created Sugar Cookie Toast Crunch to replicate the taste of Christmas cookies … for breakfast. 5. FRENCH TOAST CRUNCH WAS THE MOST POPULAR SPINOFF. In 2006, General Mills removed French Toast Crunch from supermarket shelves due to low sales, but after years of tweets and fan mail, General Mills revealed that French Toast Crunch would be coming back to the American market in 2015. (The Canadian version had been available north of the border the whole time.) Thanks to the passion and perseverance of fans, French Toast Crunch is proof that sometimes Facebook petitions actually work. 6. MONOPOLY ONCE GOT IN ON THE CINNAMON TOAST CRUNCH ACTION. Or, at least, they probably did. In 2003, General Mills partnered with the board game Monopoly to release a limited edition Monopoly cereal. The cereal consisted of cereal squares that looked suspiciously like Cinnamon Toast Crunch mixed with colored, Lucky Charms-esque marshmallows modeled after Monopoly cards and hotels. Nice idea, but playing with your food when it's soaked in milk is difficult. 7. NOT ONLY CAN YOU EAT CINNAMON TOAST CRUNCH, YOU CAN VAPE IT. Cinnamon Toast Crunch is such a popular flavor that you can even smoke it. E-cigarette users can inexplicably purchase a few different Cinnamon Toast Crunch flavors, so now you can have your cereal and vape it too. 8. NEVER FEAR, YOU CAN PROBABLY FIND CINNAMON TOAST CRUNCH ABROAD. In Montreal and other parts of Quebec, Cinnamon Toast Crunch is called Croque-Cannelle, while in the UK and Ireland it now goes by Curiously Cinnamon (which also has a strawberry-flavored variant called Curiously Strawberry). In Poland, Cinnamon Toast Crunch is called Cini Minis, and it features the same images of the Crazy Squares in advertising. 9. SELFIE-SPOONS EXIST THANKS TO CINNAMON TOAST CRUNCH. In 2015, General Mills announced that it was giving away free Cinnamon Toast Crunch selfie spoons, a.k.a. two-and-a-half-foot selfie sticks with spoons attached to them. This marketing campaign gave 1000 selfie spoons to Cinnamon Toast Crunch/selfie lovers, who only had to pay for shipping and handling. As the tagline for the selfie spoon said, “If you don’t post it on social media, did it really happen?” Truly the question of our time. 10. SLOGANS HAVE CHANGED OVER THE YEARS, BUT THEY'VE NEVER QUITE FOUND A GREAT ONE. The tagline for Cinnamon Toast Crunch has changed a few times since 1984. From the straightforward “I'm feeling like Cinnamon Toast Crunch” to the more synesthetic “The taste you can see,” the cereal’s slogan has never been nearly as memorable as other cereal’s taglines (think Frosted Flakes's "They're grrreat!" or "Silly rabbit, Trix are for kids!"). Since 2009, Cinnamon Toast Crunch commercials have centered around the phrase “Crave those crazy squares," which could probably still use some work.